According to reports, Anil Kumble is set to attend the event. The Indian skipper Virat Kohli tied the knot with Bollywood actress Anushka Sharma on December 11 in Italy at a scenic venue. The couple is all set to host their second reception in Mumbai, they earlier hosted a reception in New Delhi at Durbar Hall, Taj Enclave. They will host their second reception at St.Regis on Tuesday where Zaheer Khan and Sagarika Ghatge earlier hosted their reception. Their wedding is the most talked about event of 2017, the news of the wedding was doing rounds on social media ever since Virat Kohli was rested for the limited overs series against Sri Lanka. The marriage was kept as a secret from the media and there were numerous rumours and speculations about the wedding. When the couple finally had the marriage rituals, they shared their marriage pictures on their social media accounts. This garnered the attention of the media as well as their fans. Soon the lovely pictures and videos of the ceremony started making rounds on Twitter and Instagram in which both were seen gushing over each other. The couple is currently hosting their reception at St.Regis in Mumbai. Both Mr and Mrs were dressed in casuals as they walked in through the gates of Mumbai’s St. Regis – Virat arrived in tee and pants while Anushka wore a comfy denim jumpsuit. The event is supposed to be held for cricketers, Bollywood superstars and businessmen like Mukesh Ambani. The Indian cricketers are currently in Mumbai after the 3rd T20I against Sri Lanka was played in Mumbai. According to reports. the best news from the reception is that former India coach Anil Kumble has already arrived at the venue. From Sehwag to Gavaskar to Kumble to Bumrah to Umesh to Jadeja – they are all there at the St Regis. Badminton superstar Saina Nehwal has also graced the event with her presence. 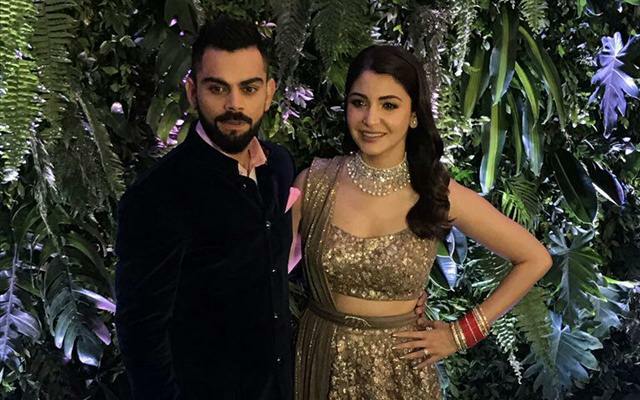 Kohli looked charming in formal wear and Anushka Sharma looked gorgeous in a lehenga designed by famous designer Sabyasachi.